UPDATE 6/26/05: I finished my second suit. This time I added an inch over the breasts, easing this extra length into the back, and I added an inch at the outer thigh, tapering in towards the crotch. I think it came out pretty well. UPDATE: Oops, I forgot to mention that I fully lined the suit, see the section on Pattern Alterations or Design Changes for more info. Y-back swimsuit with circle cutout in back. There are 2 options for the leg openings: boy leg and high cut. This pattern comes with sizes from bust 21.25 inches to 56 inches (size 2T to GG). I used size BB which corresponds to my full bust and hips. I usually use the high bust, but since this has a Y back, I wasn’t concerned that it would fall off my shoulders. Yes; too bad I don’t look like the models. Um … no. I used the instructions from the Kwik Sew swimwear book. I wouldn’t recommend making this suit if this is your first swimsuit and you don’t have a reference like the Kwik Sew book. LIKE: the style. This is a suit designed for swimming. I have great ease of movement when swimming. It’s TIGHT and short (i.e. I wouldn’t want to sit for long in it). 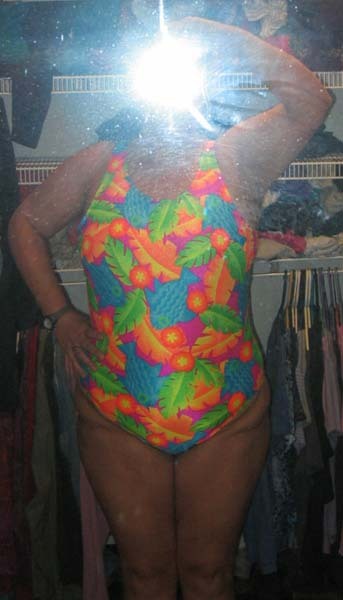 I had to shorten the Kwik Sew swimsuit several inches in the crotch; I didn’t have to do this for this suit. DISLIKE: the options for the leg holes. Neither choice is flattering on me. It would have been nice to have a leg option between the boylegs and hicut. DISLIKE: Why do pattern designers almost always assume that larger sized women are a B cup? Clearance dance/skate fabric from Joann’s. This is a toile. However, I used this fabric before for a suit, and it held up just fine. None, but next time, I will lower the leg holes, add length in the bust area (width is fine), and shorten the back. I fully lined the suit. The pattern instructions don’t call for any sort of lining, except for a crotch flap. I’m in the middle of the alterations right now for the next one, and I think this is a great suit for serious swimmers.